Approximately 49 pages (8.5×11) of wonderful hand inked drawings and typewritten pages. 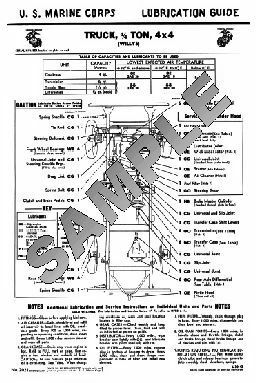 Includes the rare USMC Lube Charts for the MB/GPW and the 2 1/2-ton trucks. You will learn the Marine Corps way of maintenance…. This manual was original put together by the Motor Transport School, Marine Corps Supply Schools, Supply School Battalion, Camp Lejeune, North Carolina. 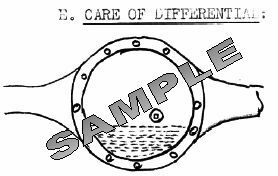 The manual is designed to be useful for most WW2 wheeled vehicles. It’s a great little manual. The drawings may not be as sophisticated as those published in WW2 Army Motors but they get the job done. It’s a great volume to add to your collection, USMC Preventive Maintenance. You will learn a lot of useful information even if you are NOT into Marine Corp wheeled vehicles. This manual is not currently available. If interested, contact me and I will see if I can make it available again.